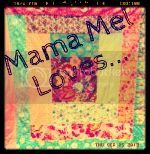 Mama Mel Loves...: Celebrating My 100th Post With a Giveaway! So, to celebrate I'm having my first giveaway! Since I've never done this before, I thought I'd start simple by giving away a sock monkey in a cute argyle "sweater", handmade by yours truly... along with a $10 Target giftcard! Each extra credit item gives you an extra entry into the giveaway. But, be sure to place a comment about each extra thing you do. Also, please leave your email address in at least one of your comments so I can get in touch with you if you happen to be the lucky winner! :) I will be choosing the winner on Monday, August 3rd, using Random.org. He is SO adorable! I think he would look perfect on my desk at work next to my flying monkey! It is a marvelously Super Saturday! Aww! I love sock monkeys! I would love to adopt Mr. SockMonkey so that I could have someone to love while we wait for our real adoption to come through! Congrats on being the first sits commenter today! He is super cute and my kids would love him:-). Congrats on you 100th post!! I started blogging just a bit before you...in February. I think Mr. Monkey would get lots of love in our home. Meghan might like to claim him, but I'd like Evan to have him. The gift card is awfully sweet too! And I am a follower to! My little one would give Mr. Monkey lots of love!!! My family would like to adopt Mr. Monkey because we are a family of little girls and they keep asking me for a brother. He is so cute! Congrats on being #1 at SITS today! I'm following you. I hope you will visit. I post marital secrets for young wives, mothers, and couples. Congrats. I see a lot of people get excited about there 100. Mine is coming up. i suppose I should start preparing something grand! Congrats on your bloggy milestone and happy Saturday to you! I am slowly making my way around to all the blogs that visited me when I was featured on SITS to say "Thank you". It is indeed a fabulous SITStahood. Congrats on your 100th post! Great giveaway. I'd love to win b/c he is so cute and I love target. i would love to adopt mr.monkey because he is too darn cute not to! what a cute little monkey! my husband had "monkey" when he was itty bitty and mr. monkey would be very well loved by our soon to arrive little boy (due in just a few weeks). I think Mr. Monkey would be a perfect little cuddly for my baby boy due next month. And I'd love to use the Target giftcard to get him some newborn diapers! congrats on your 100th post!!! I would like to adopt him for my boys, they LOVE LOVE LOVE monkeys!!! I would like to adopt Mr. Monkey because he would be so cute sitting in my living room chair. My youngest daughter is a monkey fanatic! She's been enamored with all things monkey since she was just a baby... she would absolutely love to have this! my daughter will love it.. Awesome give away! Why should I win? Well, my son is part monkey as he just loves to climb everything, and he absolutely LOVES monkeys, and he would just love this. I'm already following you here, and I'll be following you on Twitter soon, and I'll post a link to your giveaway. Thanks! Have a fun SITs day! Monkey is super cute! My daughter's first birthday was a sock monkey theme so it has carried on! He'd look great in her room! Happy 100th! My kids would love that little Monkey. Congrats on the 100th post! Mr. Monkey is adorable! Happy 100th - Stopping in from SITS!! He is just to cute in his little sweater and would make a cute friend!! Aaaawww. He is soooo cute! And I love his little sweater!!! 100 came up fast for you! I think everyone should love Sock Monkeys! I am working on ideas for my next giveaway on my giveaway blog. Cute blog! Congrats on your 100th post! i would like to adopt the sock Monkey because the green monkey that we have needs a monkey friend. My little guy would love to adopt your sock monkey...because he doesn't have one, and his sister does. :-) And, everyone needs a sock monkey, eh? Happy SITS Saturday Sharefest! I'd love to adopt the sock monkey...I know a certain little girl who'd love him! I have been trying to have a baby for the past year. Maybe this sock monkey would be just the good luck charm I need to make my dream a reality. I think it would look lovely in a nursery some day. Congratulations on your 100th post. I think he is the cutest sock monkey ever, just look at those big blue eyes. I love the sock monkey's sweater! I would like to adopt him to add to my sock monkey family! 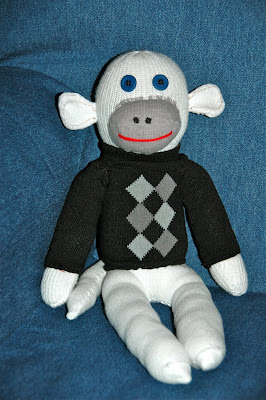 Found you via SITS:) I'm embarrassed to say my kids have never had a sock monkey, so this would be a great surprise. I love the sock monkey, I would want to adopt because my daughter (10) absolutely adores sock monkeys! I'd love to adopt that adorable monkey because he's such a snappy dresser! I am now a Follower.... =) I really want that cute monkey! And the captcha at the bottom is "plese" how perfect is that? Pu-lease? I definitely know my grandson would love this little guy and would give him a 'kiss-kiss', and would read stories to him, or hear stories about him. Lots of love to be shared!